Remarkable opinions from a Buenos Aires district judge after conducting the first trial by jury of his life. Presiding Judge Félix Roumieu narrated to EL SOL his experience after the first jury trial in the history of the city of Quilmes, province of Buenos Aires. The guilty-verdict-trial has been a huge success and has garnered auspicious repercussions in the region. The first trial by jury in Quilmes has left many issues to be discussed; among these, how did the citizens who participated in this novel experience feel? Or perhaps, what are the roles of each party in the kind of trial that made its debut in this district? It seems, from the auspicious impact it has had on all levels, that trial by jury is here to stay. For Judge Félix Gustavo Roumieu this was not “just another trial.” It was a challenge in his career, as he had the responsibilities of interacting with the jury and giving meticulous instructions to the people that assumed the responsibility of doing justice. "I've really felt comfortable. It has been gratifying to work with juries. It was an important commitment for all those who are part of the courts and, in light of the events, we are very pleased and satisfied. I think this improves the service of justice, which is ultimately the aim of those who are part of the judicial system." Later, after a query from EL SOL Journal, Roumieu added that "it is an excellent tool; surely there will be things that have to be improved as trials go by, but I think that allowing simple citizens to take responsibility for providing justice is something very healthy for democracy and the institutions of our country." As stated in the law, the main functions of the judge are to conduct the hearings in an impartial manner, guarantee the exercise of the rights of the prosecution and defense, and ensure that the jury may deliberate and reach a verdict in accordance with the procedure. Also, when jurors reach a guilty verdict, the judge must apply the law to the charge for which the defendant has been considered guilty and decide the punishment he or she deserves for that charge. "I think that for the perception of the image that society has about ´justice,´ these kind of procedures are extremely healthy, because the 12 jurors and alternates who have participated in this first trial will tell their experience to their families, friends, at work, then it will also happen with others and so on... I have the impression that this is to bring justice closer to society." It is important to recall that months ago the “Citizen Handbook about Trial by Jury” was presented and distributed as school program content to students in their last years of secondary school in the province of Buenos Aires. The Director General of Culture and Education Nora De Lucía and the Minister of Justice of the Province Ricardo Casal presented the "Citizen Handbook about Trial by Jury" during a ceremony at the Government House in La Plata. There, they also agreed to incorporate the training on jury trial as part of the school curricula for students in their last years of secondary school in the province. 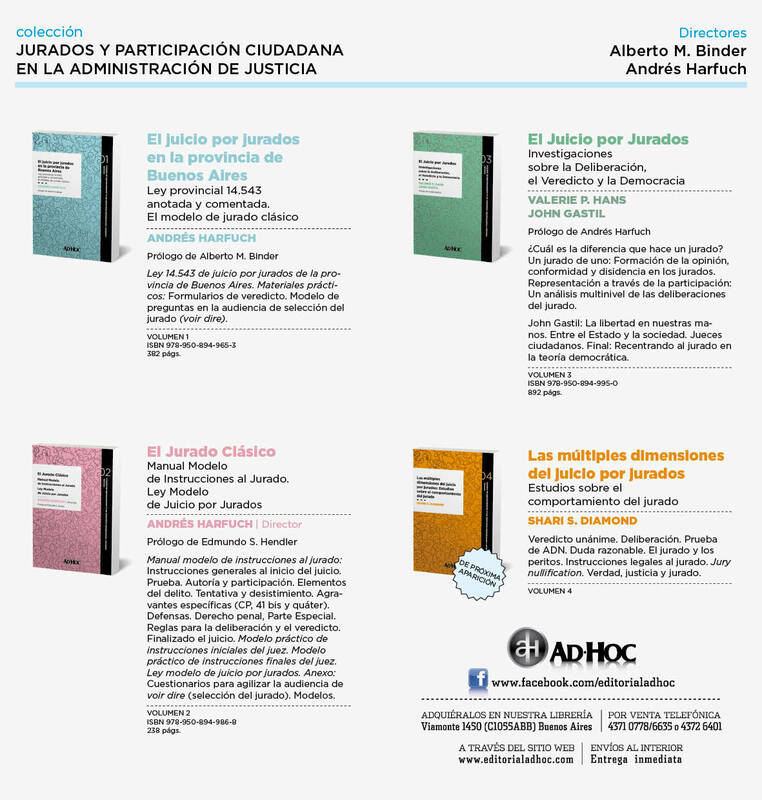 The publication didactically addresses the requirements that every citizen must meet to be a juror, how jurors are selected, how a trial of this type develops, and the functions of each of the parties in the process. It also describes the development of the first jury trial in the province and the perceptions that all participant citizens have had. 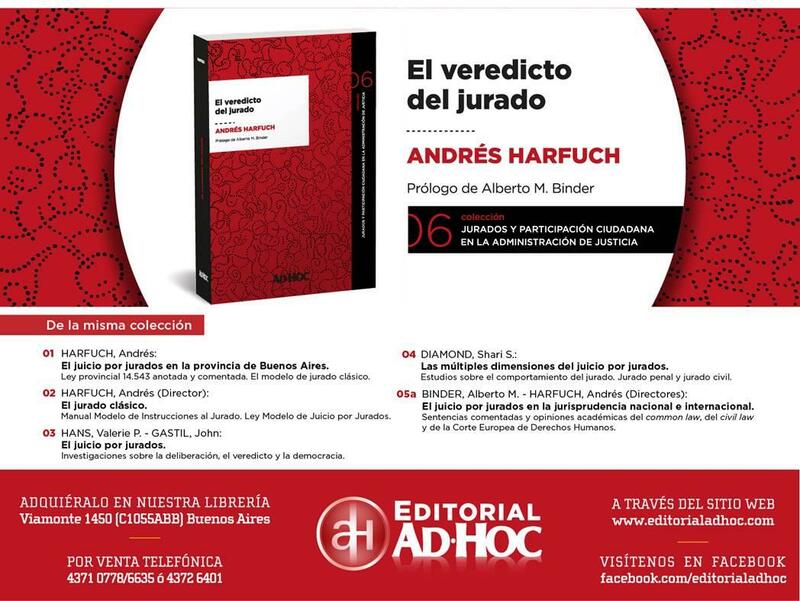 Trial by jury is one of the most important reforms of recent decades in the field of justice and puts the provincial administration at the forefront of the Criminal Procedure System of Argentina and Latin America.